Our Nibs, powder and butter come from the ‘Criollo’ cacao variety, known for its fabulously delicate, unique flavour and sweet aroma. It is sought after by the finest choclatiers in the world. 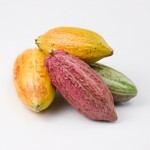 All chocolate is made from cacao beans, but mostly from the Forrastero and Trinitero varieties which are more bitter, not as difficult to cultivate as criollo and therefore can be mass produced. Our cacao is grown organically in the Chanchamayo/Satipo area of the central Amazonian region of Peru. All the antioxidant value, mineral benefits, neurotransmitter rejuvenating properties and overall health-giving qualities of chocolate are found in abundance in our raw Cacao. Unlike conventional cooked chocolate it does not have any sugar, dairy or soya added nor does it go through any chemical processes that reduce and destroy its natural health giving properties. The raw cacao bean is one of nature’s most fantastic superfoods due to its having the highest concentration of antioxidants of any food in the world, an impressive mineral content and wide array of unique and varied nutrients. Many of the special properties of cacao are destroyed or substantially reduced by refining, processing and cooking at temperatures exceeding 120° celsius . To avoid this, our Nibs follow a strict shorter fermentation and drying process at no more than 40° celsius. So there is fantastic hope for chocoholics everywhere! You can turn cravings for cooked, processed, chocolate into super-nutrition! Furthermore there is no evidence to implicate cacao bean consumption with obesity. In fact raw cacao is one of the great weight loss foods because within its extraordinary nutritional profile it actually contains the minerals and molecules that shut off the appetite! CACAO-BEST NATURAL FOOD SOURCE OF THE FOLLOWING NUTRIENTS ! Magnesium: Cacao seems to be the #1 source of magnesium from any food. This is likely one of the primary reasons why women crave chocolate during the monthly cycle. Magnesium balances brain chemistry, builds strong bones, and is associated with more happiness. Many people are deficient in magnesium due to their diet. Cacao has enough magnesium to help reverse deficiencies of this mineral. Iron: Cacao contains 314% of the RDA of iron per 1 ounce (28 gram) serving. Chromium: is an important trace mineral that helps balance blood sugar. Cacao has enough chromium to help reverse deficiencies in this mineral. Anandamide: is an endorphin that the human body naturally produces after exercise. It has only been found in one plant — Cacao! It is known as “the bliss chemical” because it is released while we are feeling great. Cacao also contains enzyme inhibitors that decrease our bodies ability to breakdown anandamide. This means that when we eat cacao, the anandamide may stick around longer, making us feel good for longer! Theobromine: Cacao usually contains about 1% theobromine. It is an effective anti-bacterial substance and kills streptococci mutans (the primary organism that causes cavities). It is a chemical relative of caffeine but has only a ¼ of its stimulating power. Theobromine dilates the cardiovascular system making the heart’s job easier. Antioxidants- cacao contains more than red wine, blueberries, acai, pomegranates and goji berries combined ! Cacao Nibs score 62,100 per 100grams– this is the highest of any food on the ORAC scale (Oxygen Radical Absorbance Capacity scale developed by the U.S. dept of Agriculture to measure the effectiveness of antioxidants to absorb free radicals that cause cell & tissue damage) Goji berries comes in at 25,300. These antioxidants include Polyphenols, catechins, and epicatechins. So a little goes a long way. Manganese: helps assist iron in the oxygenation of the blood and formation of hemoglobin. Zinc: plays a critical role in the immune system, liver, pancreas, and skin. Additionally, zinc is involved in thousands of enzymatic reactions throughout the human body. Copper: In the human body, it helps to build healthy blood. Omega 6 Fatty Acids: Cacao contains essential omega 6 fatty acids. All cooked and processed chocolate contains rancid omega 6 fatty acids (trans-fat) that can cause an inflammatory reaction. Phenethylamine (PEA): is found in abundance in cacao. Because PEA is heat sensitive, much of the PEA in conventional cooked chocolate is missing. PEA is the chemical that we produce in our bodies when we fall in love. This is likely one of the main reasons why love and chocolate have such a deep connection. PEA also plays a role in increasing focus and alertness. Tryptophan: is an essential amino acid that is transformed into important stress-protective neurotransmitters including serotonin and melatonin. It is heat sensitive and therefore it is “cooked out” in conventional processed chocolate.